Brain imaging genetics is an emerging research field to explore the underlying genetic architecture of brain structure and function measured by different imaging modalities. However, not all the changes in the brain are a consequential result of genetic effect and it is usually unknown which imaging phenotypes are promising for genetic analyses. In this paper, we focus on identifying highly heritable measures of structural brain networks derived from diffusion weighted imaging data. 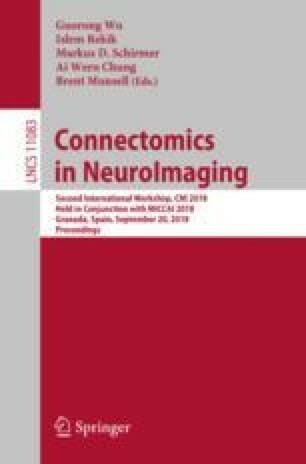 Using the twin data from the Human Connectome Project (HCP), we evaluated the reliability of fractional anisotropy measure, fiber length and fiber number of each edge in the structural connectome and seven network level measures using intraclass correlation coefficients. We then estimated the heritability of those reliable network measures using SOLAR-Eclipse software. Across all 64,620 network edges between 360 brain regions in the Glasser parcellation, we observed \(\sim \)5% of them with significantly high heritability in fractional anisotropy, fiber length or fiber number. All the tested network level measures, capturing the network integrality, segregation or resilience, are highly heritable, with variance explained by the additive genetic effect ranging from 59% to 77%.